There�s nothing more impressive than a home that gleams. 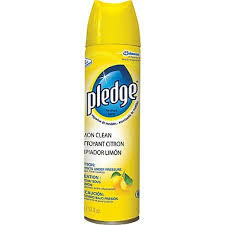 Pledge� Lemon Enhancing Polish improves the appearance of most hard surfaces by removing dust and fingerprints and providing a protective, glossy coating without leaving a waxy buildup. It provides a fast, easy shine on multiple surfaces, including wood, leather, granite, stainless steel, laminate and quartz*. Leave a beautiful shine and a refreshing scent that will illuminate your home and welcome people in. This is a non-stock item.